"Move comfortably between the discret elegance and a casual look"
Perfect either if you use them with a suit or with jeans, The Hamburg is the ideal shoe for any season of the year. Fabricated in Spain, this Oxford in dark brown suede will give a touch of distinction to your style thanks to the brogue in the tip and the heel. Plus, it will let you move comfortably between the discreet elegance and the casual looks..
Our model The Hamburg is a fantastic and comfortable choice to the classic skin. 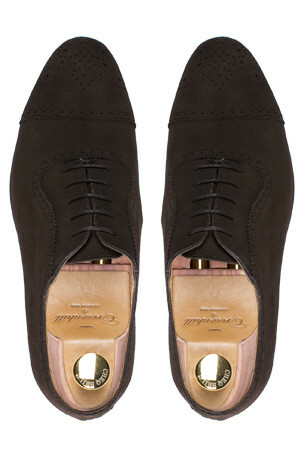 Thanks to the texture and the dark brown tone, this shoe combines perfectly with gray suits and any gradation of brown. If you are willing to use a casual look, the chinos and jeans with these shoes will be your best friends. The Hamburg is made with the best and first quality box-calf and hand-sewn following a Blake construction. Mounted in our Crawford last, and we obtain a more elongated and rounded toe cap than the model The Chicago. The leather sole has a non-slip rubber embedded Spy, which will get that rainy days won’t be a problem anymore. In addition, our patented FlexiComfort system will absorb the weight of the foot making your feet comfortable and you won’t pay the bill for the long days at the office. High quality shoes that I would recommend to friends. After buying already three pairs i can validate the good quality. I will probably buy another pair for me in the short term because I think the image, quality and price are very good! Very good quality shoes that I will recommend to family and friends. I bought the shoes for one of my friends because of his birthday and I can see the good quality. I will probably buy another pair for me in the short term because I think the image, quality and price are excellent!! This nice finished suede half brogue is extraordinary chique outer finish and goes along perfectly with chinos and jeans. The materials are of great Quality, the shoe fits perfectl for the mentioned size which is comparable to C&J sizing but with a mich greater price Quality Ratio. Thanks to the manufacture for buildung such a nice piece of craftmanship!